Collaborative robots - or cobots as most are affectionately known - are bringing the fences down in manufacturing and production facilities all over the world. Unlike early industrial robots that had to be isolated behind a protective cage, this new wave of robots comes equipped with sensors, vision and, in most cases, plenty of programmed self-control, enabling people and robots to work safely side-by-side. Always ahead of the curve, FANUC has recently launched the world’s first collaborative robot with an impressive payload capacity of up to 35 kg (exceeding all current competitor robots by 24kg). Compared to its yellow cousins, the Kermit-green FANUC CR-35iA is a totally cage-free species of robot. Designed for tasks like heavy workpiece transfer and parts assembly, robot and human operator can work collaboratively alongside each other without a safety fence. 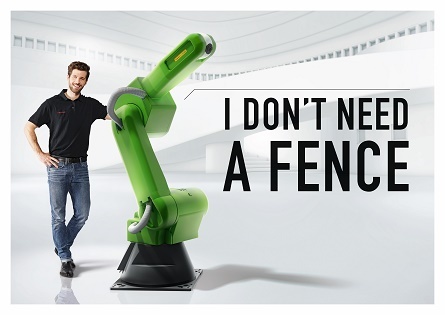 A dexterous 6-axis arm with a reach of 1.813 metres, the CR-35iA also has a gentler side, including a soft green surface to reduce impact force and prevent a human operator being pinched. Certified to meet the requirements of international standard ISO 10218-1, if it comes in contact with a human co-worker or any object with a certain force, it stops or retracts immediately. In Japan, the robot has demonstrated its unique higher payload credentials, lifting and putting down a wheel. Thanks to the success of the 35kg payload collaborative robot, FANUC will shortly introduce another collaborative robot to their range - the CR-7iA with a payload of 7 kg with mechanics corresponding to that of the company's LR Mate-series. This newest development represents a significant leap in addressing robotic safety hazards. Although it doesn’t eliminate the need for comprehensive workplace risk assessments, the increased adoption of peripheral safety devices is enabling robots and humans to work in close proximity of each other, eradicating the fear of interrupting production or worse, causing an accident. “Until recently, the mindset of most people was if you have a robotic hazard you banish humans from the robot working area with a physical guarding solution,” highlights Steve Capon, technical manager at FANUC UK. “That thought process for many is changing thanks to rapid advancements in sophisticated software control technology and integrated safety.” This now means that you can impose set limits on how fast your robot works and the operational areas it can and can’t enter, programme your robot to slow down as it approaches a hazard rather than coming to an abrupt standstill, and even introduce presence-sensing detection. Above all, the newest robotic software is enabling manufacturers to think more creatively around how automation equipment is deployed and how companies can boost production efficiencies whilst also saving space in valuable commercial real estate. “Safety risks vary depending on the selected robot and application,” emphasises Steve. “One of the key advantages of being able to embed more of the safety-related functions into the robot controller is you can design out the various safety hazards whilst also eliminating the need for external fixtures or mechanical devices to supply this functionality. FANUC recently demonstrated an example of a fenceless robot cell in collaboration with Rockwell Automation. In this showcase, Rockwell safety laser scanners were installed close to floor scanning horizontally for any approach to the system. As an intrusion got closer, these scanners informed the robot system to operate slower. Additional mini scanners were concealed under the FANUC robot system mounting, providing an invisible shield and initiating the robot to stop when the box of light is encroached. Many of these developments, including FANUC’s Dual Check Safety (DCS) Position & Speed Check solutions, were initiated in the automotive sector on FANUC CNC robots. However, the trend for built in logic and safety motion is rapidly spilling into other markets, including packaging and palletising, claims Steve. In addition to meeting the safety requirements for electronic control systems, DCS Speed and Position Check offers significant benefits to applications where the travel of the robot needs to be restricted due to floor space or process limits that are less than the full reach of the robot. Restricting the robot motion in Cartesian space means the robot can be restrained to exactly designated safe area in which it works; something that is not possible with systems that limit robot motion externally using limit switches. Ultimately, the onus on safety still rests with humans. Even with all these technology advancements and comprehensive workforce training you can’t risk becoming risk complacent. Deep within our human genetic makeup is that niggling desire to test the boundaries and ‘see what happens’. Every intentional and unintentional scenario when interacting with robots should be factored in when conducting regular risk assessments. With safety, getting it mostly right isn’t an option!